Here's how to move an existing WordPress site to your Pro Managed WordPress account. Note: Pro accounts are available only in the United States and Canada. To move an existing WordPress site to your Basic, Deluxe, Ultimate, or Developer account, see Move my WordPress site automatically. In the WordPress Sites page, click Add Site. 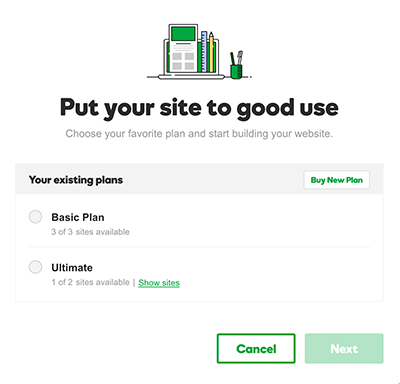 From your list of plans, click a plan to use one of its available sites, and then click Next. Note: To see the sites already used for a plan, click Show sites. Select I'm migrating an existing site and then click Get Started. Confirm the data center location (it's where we'll place the files for your migrated site) and then click Next. Enter the Site URL you want to migrate, your WordPress Admin username and password, and then click Next. Read the message about the plug-in, and then click Install. We'll start migrating your site, which could take up to two hours depending on the size of the site, and then we'll email you when we're done.